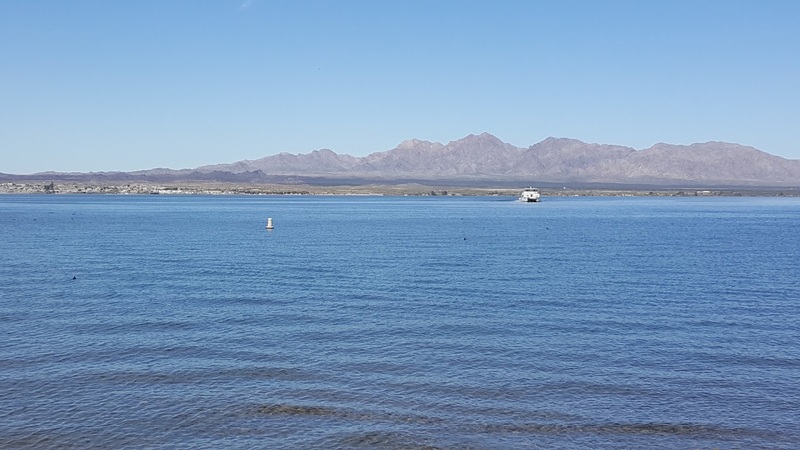 We really enjoyed our stay at Katherines Landing on Lake Mohave. But, it was time to move on. Lady Blue needs an oil change, so we head south on Route 68 to Route 95(Az) through Bullhead City. A quick ride east on Route 40 and then south again on Route 95 to Lake Havasu City. 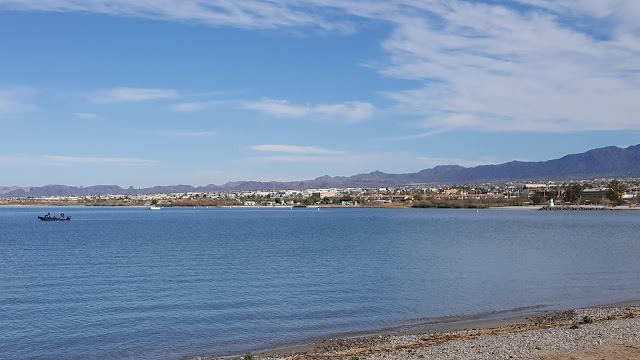 We could have changed oil easily in Bullhead City, but we enjoyed parts of Lake Havasu before and decided to have another look. 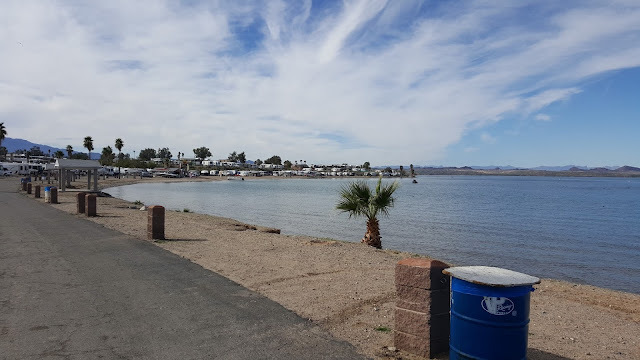 We passed a number of BLM land , free, camping areas, but chose to go to a private campground right on the lake----also a good spot for laundry. This was Crazy Horse Campground and the view above is from some of the beachfront sites. As you can imagine these waterfront sites are quite popular. Lake Havasu hosts a number of events throughout the winter. Last weekend was a display produced by fireworks manufacturers. 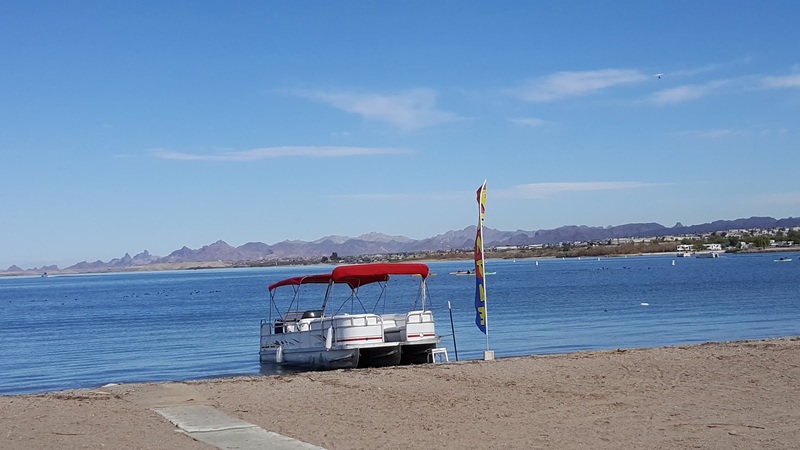 We understand it attracts one of Havasu's largest crowds. The trip south from Bullhead City to Topock and then Havasu City follows the Colorado River and also the California/Arizona border. From the beach view, this is a ferry boat coming back from the California side. It docks right in the campground. By the way the campground has 648 sites. Very large!. Many rentals available at the campground. Everything from this pontoon boat, to jet skis and other boats. 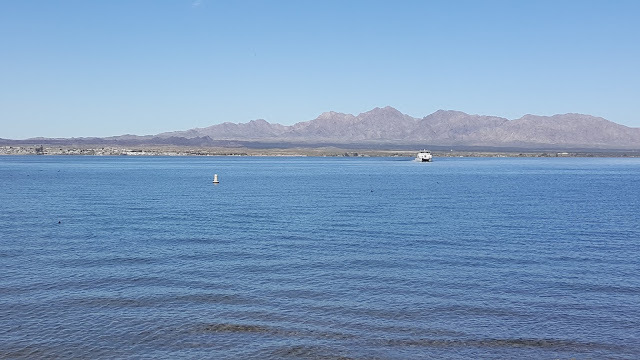 This view is towards Lake Havasu City. This is the southern end of the city. 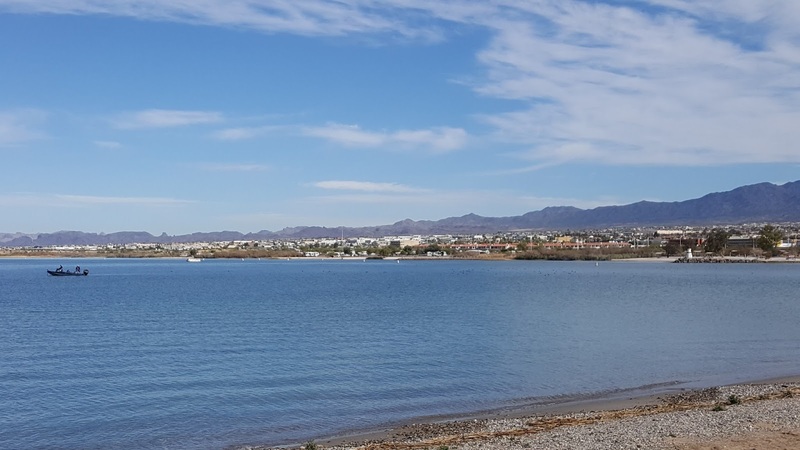 A fairly short walk from the campground--a half mile or so---brings you to a couple of nice restaurants on the water. The London Bridge--we had pictures on our blog in the January 31 issue of 2015--is just a short walk further. If you are interested in past blogs just go to the right of the home page , scroll down past the "My Blog List" to the "Blog Archive" list. Clicking on the arrow to the left of a year will give you the months list. Clicking on the months list will give you the issue titles list within that month. Every now and then we have to check back to Grand Tetons or Glacier National, or pictures from different years in New England. 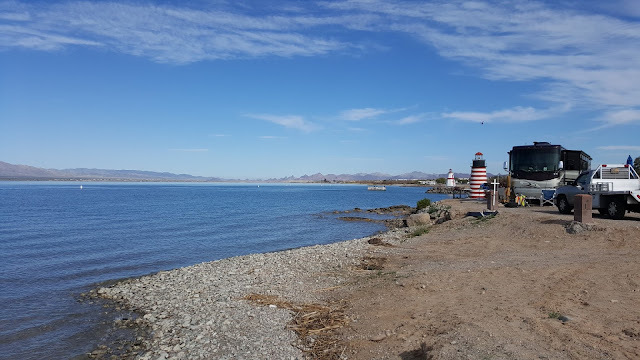 From Lake Havasu we head back north on Route 95 to Route 40 west. 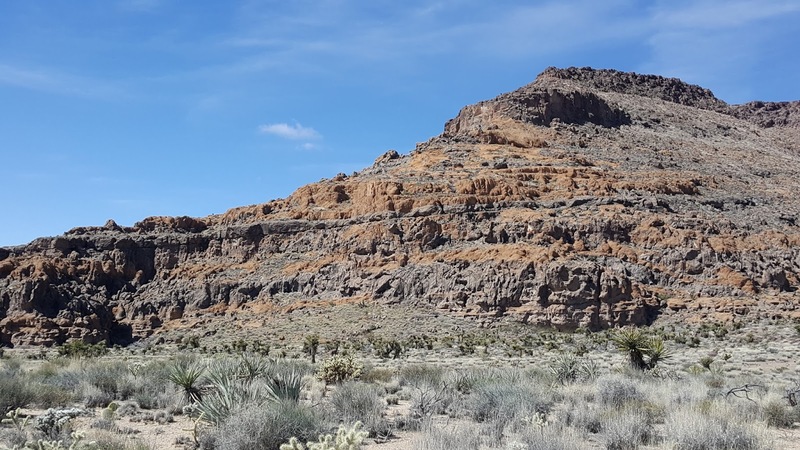 Once into California, we note a very unpopulated area into the Mohave National Preserve. We had marked a dispersed camping spot off Exit 115(boondocking) , but when we headed up the exit ramp we saw that the road was closed.???? 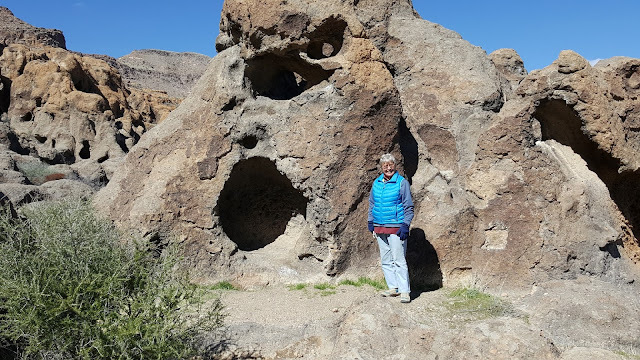 Actually , it was a good sign, because we headed a bit further on Route 40 to the Hole in the Wall Campground exit for the Preserve(EssexRoad). The campground is about 20 miles off the interstate. Good separation at the sites. $6 per night with our Senior Pass. The entire campground is dry camping, but there is a dump station with a fresh water threaded source. There are also a number of fresh water hand pumps around the loop. Hole in the Wall refers to the rhyolite rocks that have dissolved over the centuries to form walls of rock that look like swiss cheese. 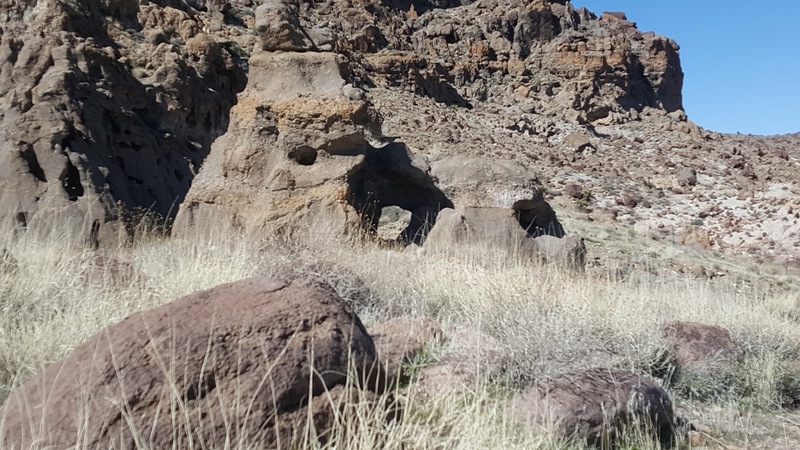 There are a number of various hikes in the area. Some relatively easy--yea!-- some more difficult with rock climbing and metal rings mounted in the rocks for some more difficult parts of the climb. To make some of our New England readers happier, we will report that our warm outergear is necessary because our high daytime temperature is about 46 degrees and our night time temperature just went down to about 26 degrees. That was while Boston was reporting 73 degrees yesterday-a record we understand. We do climb a little. 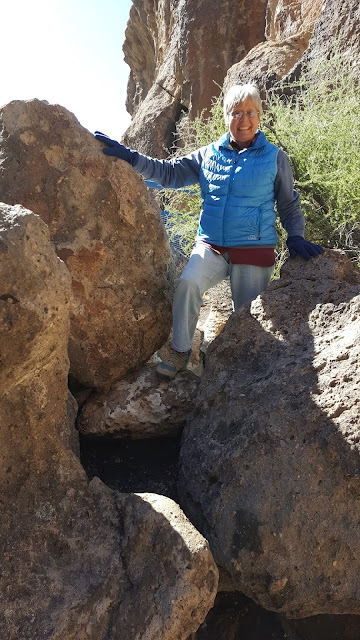 And we did hike for a bit over the different trails. Another favorite spot. 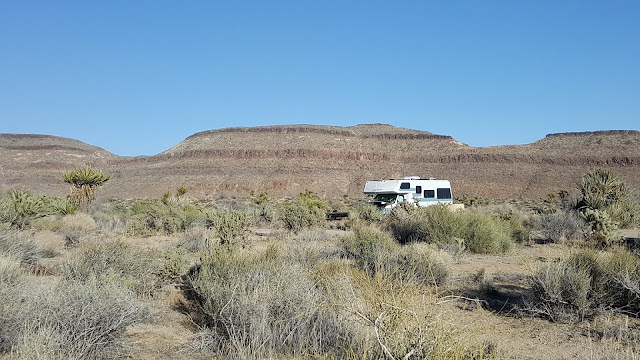 This campground also had good satellite reception and cellphone coverage. No idea where the towers are and there are no towns nearby, but the signal was good. 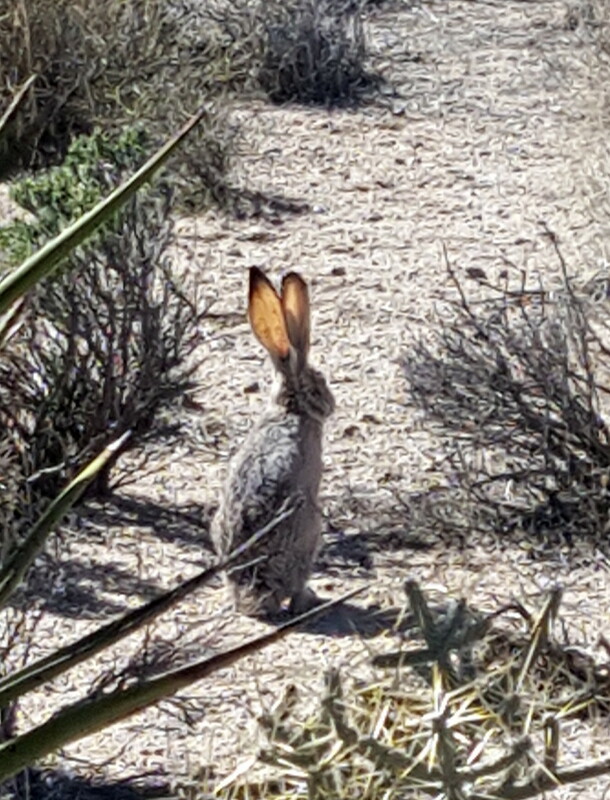 We are continuously entertained by a number of jackrabbits. Question for Lucas, Madison, and Emilie. Do you know why jackrabbits have long ears? Look it up on the internet or have Mom or Dad check. This was our view from the front of Lady Blue. 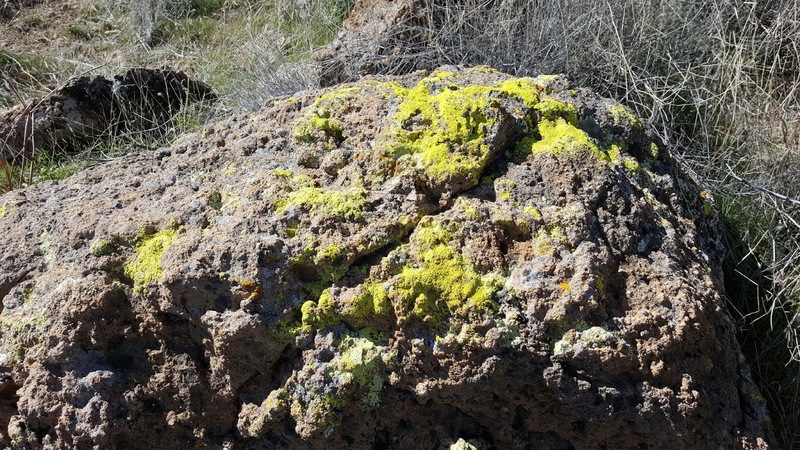 Different lichen along the hike. Some bright yellow. Others orange. 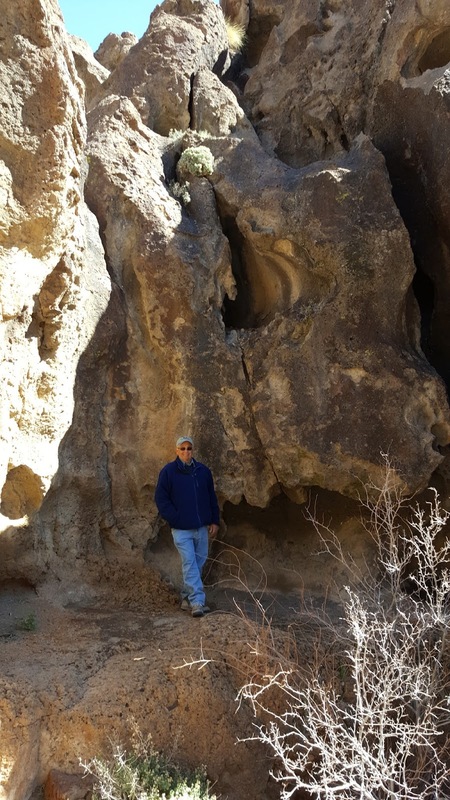 The park host indicated that this section of California has already had over 4 inches of rain this year. That is about the normal total for an entire year. 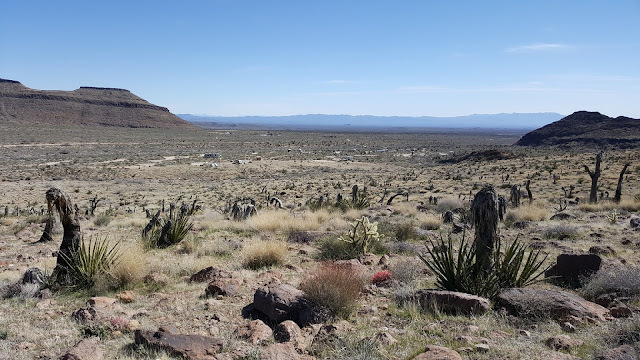 A view from our hike back towards our campground. Can you see Lady Blue? Some of the holes are all the way through. A few pictures of one of our sunsets. More impressive was the wide open clear view of the stars at night.